Celebrate your wedding in style at our beautiful wedding venue in Somerset. Your wedding and celebrations at Hornsbury Mill will be tailored to your individual needs for a day to remember. All weddings will be arranged with our expert professional wedding planner who will ensure your event runs smoothly. 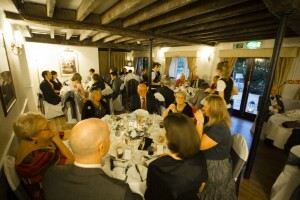 At Hornsbury Mill, we believe in catering all weddings hosted at our Somerset wedding venue to suit your needs. Read on below to see how we will make your big day more special. For a wedding with a difference, a civil ceremony in our natural surroundings in Somerset will ensure that you have a day to remember. At Hornsbury Mill, we have a civil ceremony license to host your wedding in our beautiful landscaped gardens. Our team of wedding planners can arrange an all-inclusive package for your special day which includes: civil ceremony, reception, evening party, catering and accommodation. When you get married on our grounds, you will have a variety of locations to choose from to have your ceremony. If you want a more intimate and romantic ceremony, the candle-lit Cornloft is perfect for the occasion. Alternatively, our Gazebo which is situated near an idyllic lakeside offers couples a unique al fresco wedding experience. Are you hosting a church wedding? Once your church ceremony is over, we will be more than happy to you and your wedding party to Hornsbury Mill. We have the facilities to host wedding breakfast and an evening reception in our grounds. At Hornsbury Mill, we offer couples a three-course meal with a delightful selection of dishes for the Wedding Breakfast including vegetarian options. If you want to cater to more tastes, we also provide a buffet option. The ‘Lakeside Suite’ is suitable for larger weddings and seats up to 80 guests and has room for 40 more guests to be seated in the adjoining orangery. When you host your wedding in the Lakeside Suite, you will have your own exclusive bar, cloakroom and toilets. We host smaller and more intimate weddings (up to 40 guests) in the ‘Wheelroom’ which has a fully-functioning water wheel, and it is a room with great character. For a cosy atmosphere, we can set up a banquet in the cosy ‘Coachroom’. The evening reception is time for fun and our ‘Lakeside Suite’ will host from 180 to 200 guests in the evening. The ‘Lakeside Suite’ has space for band/DJ with a dance floor. If you want to personalise your evening reception, you will have the opportunity to do so in our adjoining orangery. We provide extras like a buffet, casino tables, chocolate fountain and more. Contact our team today for a wedding in Somerset to remember.